Craving for some quality time together? The holiday buzz and New Year celebrations have faded, and life has settled into the same old routine for couples. However, there’s one celebration right around the corner and is tailor-made for couples. Valentine’s day is the perfect time to escape the humdrum of city life with your partner to romantic getaways. Ditch the done-to-death candlelight dinner, heart-shaped balloons, and a box of chocolates. Plan something different this year to keep the romance sizzling as a couple. What’s even better? If you let your partner pick the romantic destinations and the holiday package of their choice. So, what’s new this Valentine’s Day? Furthermore, with the Thomas Cook Gift Card, you can add a personalised message to add that special touch. Now that’s a gift they won’t be able to resist. Where can I go with the Thomas Cook Gift Card? India is a vast country, with different cities, different landscapes, cuisines and languages – so the only problem you’ll have is choosing where to go on this Valentine’s day. You can check out our holiday packages on the Thomas Cook website and choose what kind of holiday you’d like to have – together. What could be better than exploring different romantic destinations with your loved one on this Valentine’s day? So, kick-start planning and reservations to celebrate Valentine’s Day with your partner. If you’re still confused about where to go, we’ve put together a list of 10 romantic destinations in India for your perusal. Let’s get started! Bollywood’s most favourite spot for a romantic scene in the ‘80s is still one of the best holiday destinations for couples. Surrounded by serene mountains, the Dal Lake in Srinagar welcomes you to experience a Shikara ride with your partner. If you wish to try your hand at winter sports like skiing and snowboarding, then you are sure to find the valley covered in snow during the Valentine month. The picturesque land is a mecca for sightseeing and is the perfect setting for those Instagram and Facebook selfies. How about a twist to the usual Valentine’s Day plan? If you love the dinner date routine, why not shift it to an exotic location – like the shimmering backwaters of Kerala. Thomas Cook Packages offer overnight stay in the luxurious House Boats in Alleppey in Kerala. The glorious sunset in the lagoons and lakes makes the perfect backdrop for a romantic candlelight dinner all set in the houseboat. Also, choose a holiday package with meals that serve famous authentic cuisine made with coconut and rich spices that can only be found in God’s Own Country. Don’t remember when was the last time you spend time with your partner? Time to plan a vacation to one of the best holiday destinations for couples. Sweep your partner away to experience all that the Andaman Nicobar Islands have to offer. Bring back the romance and zest of life with a walk on the shimmery sand of the famous Havelock Island. Chose and customise your itinerary to include a visit to one (or more) of the 572 islands in the surroundings. If you’re a couple that bonds over adventure sports, why not take a Scuba Dive together? Or if you’re looking for a gentler activity, why not enjoy snorkelling together in the blue waters? The scenery and splendour of these islands are so perfect, you can forego those photograph filters and capture the memories of one of your mostromantic getaways. There are several reasons to visit a city and Udaipur – the City of Lakes, the most popular wedding destination and one of the most sought-after romantic destinations. Winter is the ideal time to visit the city. 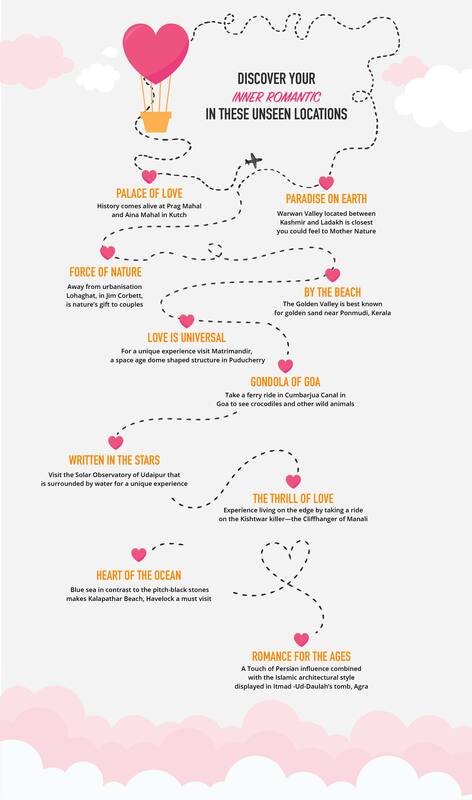 This gives you the perfect excuse to plan a romantic trip this Valentine. If you’re a couple who enjoys old school romance, then Udaipur is the place for you! Stay in a palace that exudes grandeur and gives you a taste of royalty. Absorb the Merwar history and culture when you visit the Monsoon Palace, Lake Palace and Udaipur City Palace. Take a walk around the legendary lakes, which have attracted lovers from all around the country. Book a romantic Boat Cruise with your partner to watch the glorious sunset and watch the city come to life to celebrate the Festival of Love. Can’t transform your Valentine’s celebration into a long weekend this year? A day spend in the presence of Taj Mahal—One of the Seven Wonders of the World is one of the ideal romantic destinations in India. Take a day off and sweep your partner to a romantic drive and a whole day of sightseeing in Agra. As the winter slowly turns to spring, this is the ideal time to visit the Taj and Agra Fort. This is the weather for a long, romantic walk. But that’s not all Agra has to offer, you can also visit Fatehpur Sikri and Itmad-Ud-Daulah Tomb. What’s more, you can commemorate your love with a souvenir of the Taj! Couples with kids seem to forgo most of the holidays. Can you enjoy Valentine’s Day with the entire family? The answer is yes – if you try something different this year. Plan a family trip to one of the most unusually romantic destinations. Thomas Cook gives your family a chance to enjoy the beauty of nature, with various wildlife safari holiday packages to explore. But there’s so much more about this park! Besides the animal safaris, there is a wide variety of flora, fauna and birds to see. If extending your vacation is an option, including the boat ride on the interconnected lakes of Sattal. When you’re tired, take a break, slow down and hear the call of the mountains. A Valley covered in snow is the best place to enjoy this Valentine’s if you like the cold. A serene destination and the promise of tranquillity make Manali one of the best holiday destinations for couples. Absorb the solitude found in the Tibetan Monasteries and shop for unique art and craft objects as a souvenir. If you’re looking to add a little spice and adventure to all the tranquillity, try some fun activities like Skiing, Paragliding, Rafting, and Mountaineering. Here’s a scenario for you: a short trip is all you could afford to take time off from work. And if wild nightlife is not a requisite for your vacation then Kutch is the place for you. A holiday spent with your partner at the famous white salt desert – Rann of Kutch – would be a truly surreal experience. Missed the Kutch Utsav? No problem! Live the experience with a stay in a tent and lavish candlelight dinner. Create the perfect Valentine atmosphere, ending the night under the clear, starry sky. A day spent at the salt white stretch and exploring the Kutch Desert Wildlife Sanctuary makes it one of the romantic destinations in India. Travelling to explore a whole new culture is a unique experience for any couple. Puducherry, formerly known as Pondicherry, is by nature, unique. Although located in South India, this Union Territory has a strong French heritage – from the architecture to the cuisine and more no one understands romance like the French. There are many romantic destinations to explore and the famous Aurbindo Ashram makes it on top of every visitor’s list. The numerous historical sightseeing spots – from Basilica of the Sacred Heart to the romantic the Paradise Beach or Prommenade Beach will make your Valentine memorable. As interesting as the activities of the day might be, one must experience the nightlife to gain insight into the colonial culture of the city. So, make your bookings with the Thomas Cook gift card to plan your trip to your choice of romantic destinations in India. The instant delivery of the e-gift card to the recipient makes it not just hassle-free, it also makes it safe and secure to use. The recipient can make a direct payment using the Thomas Cook gift card option for payment. You don’t have to fret on the validity of the gift card as it is valid for one year from the date of activation. To sweeten the deal, Thomas Cook now offers a 10% discount on bookings for hotel, holidays and flights with a gift card. These cards are also easily redeemable online, on the user-friendly mobile app and even at Thomas Cook outlet or kiosk for Flights, Hotels and Holidays. You can choose the Flight and hotel that you like, select the Gift Card as payment mode, enter your gift card details and click on Book Now. And Voila! You are all set to enjoy romantic getaways with your partner and the trusty Thomas cook gift card. Valentine's day is the perfect time to escape the humdrum of city life with your partner to romantic destinations and getaways. This curated list of top romantic destinations will help you pick the romantic destinations and the holiday package of your choice.